Greece, population 11 million, is strategically located at the crossroads of Europe, Western Asia, and Africa, and shares land borders with Albania to the northwest, the Republic of Macedonia and Bulgaria to the north and Turkey to the northeast. The country is a member of the European Economic Union, which has been much in the news as the country's overall indebtedness has required bailouts and emergency help from that body. Situated in the Aegean Sea it has a mild climate. For reasons of its relatively low cost of living, great weather, and idyllic setting, many Europeans have considered retirement here. Political unrest due to the challenges of austerity had been difficult for the country. Residency. If you are a citizen in the EU becoming a legal resident will be relatively easy. Citizens of the EU must apply for the new “Registration Certificate” when they have spent 3 months in Greece. The country is one of many struggling economies that is offering a residency for purchase type of program. Foreigners who purchase a home worth at least $250,000 Euros are eligible to receive a residency permit valid for up to 5 years. Crime and Security. There are frequent strikes, demonstrations and protests in Greece, particularly in Athens. You should steer clear of these. The Greek police will not accept rowdy or indecent behaviour. Crime in the city will be higher than in the countryside. Taxes. 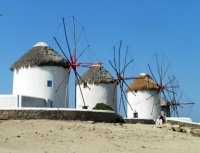 Residents of Greece must submit annual tax returns, even if you are a pensioner receiving income from another country. You must register for a tax number, which you will need to buy property and some other activities. Greece is widely known for their poor tax collection percentages. If you bring property such as a car into the country you will need to have that recorded to avoid paying a wealth tax on it. There are bilateral agreements to avoid double taxation. Here is more from Expatfocus.com. Medical. US Medicare is not honored in Greece. However medical care is excellent in most parts of the country and relatively inexpensive. Citizens of many EU countries usually have coverage, but you should research this before moving there. There have been press reports of a medical crisis in the hospitals because of the recession and resultant austerity programs. Life expectancy is 80 years. Cost of Living. The country has a much lower cost of living than either the USA or the UK. The numbeo.com price comparison (CPI plus rent) shows Greece with an index of 33, vs. the U.S. with 60 and UK at 73. The Local Purchasing Power Index shows 79 for Greece vs. 120 for the UK and 139 for the U.S.
Best Places to Live. See the list of the Greek towns and cities we have reviewed in the top right hand column. For reasons of atmosphere plus famiiarity many retirees prefer to live on the more famous islands. Athens is by far the largest city and it will be more expensive. Crete is the largest of the islands and an ancient place. Pluses and Minuses. Greece is a much cheaper alternative than the UK and France. Some expats report a fair amount of culture shock. The riots, austerity, and fiscal crisis undoubtedly put a damper on many expats enthusiasm for a Greek retirement. The weather is warmer than most of Europe. There are any number of places to live where expats will feel comfortable. The economy has been on a rough ride with very high levels of unemployment, particularly among the young. Weather. The Mediterranean climate is generally mild, even in winter.